After a record cold/wet April, May is bidding fair to make this the worst Spring in decades. Farmers are staring morosely at crops that, after a good start from a mild winter, have barely grown any in seven weeks. Blossoming trees seem at sixes and sevens about what to do and several chestnuts have been shedding damaged leaves that had only just unfurled. The weather has been driven here from the Arctic by persistent northeasterlies, which, in turn, means a livelier sea running into the Forth. This does not seem to have deterred our local yachtsmen whose racing lasers have been out capsizing regularly in the unpredictable surf of the last few days. 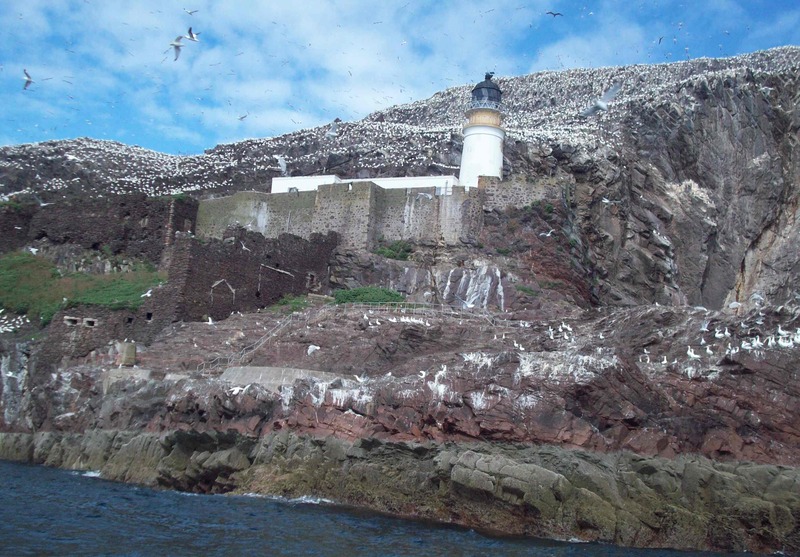 Perhaps more surprising has been the stream of people keen to go out on the Seafari boats from the SSC around Craigleith and Bass Rock. Yesterday, though the May trip was cancelled (hard to get in & out of Kirkhaven on a northeasterly) I was called in for guiding on three trips on the RIB. It was, as the locals describe it, “lumpy”. A long, heavy swell from the East was being ruffled by a ragged chop out of the North East, making passage uneven and the sea state qualify as ‘rough’. And, as we were going at 20-25 knots into it, the Force 3 wind was shredding a fair bit of spray from the bow and thrashing it over the passengers and me. My kind of weather. Luckily, everybody else loved it too (with the possible exception of skipper Brian who had to steer us safely through it). From a quintet of Italian twitchers, big enough to have been from the scrum of the Azzuris to a well spoken wedding party whose high heels looked incongruous poking out the end of the waterproofs, all treated it as a fairground ride bonus on top of seeing the wildlife. And wildlife there was: several young harbour seals hauled out below the vale in the Craig, with a big raft of puffins offshore opposite; plenty of mini-penguin-like guillemots and razorbills clumped on the cliffs or whirring overhead; cormorants and shags; kittiwakes and fulmars; and everywhere the scavenging gulls looking for an easy meal. Down at the Bass, the “gannet flying school” had hundreds aloft, gliding effortlessly in the updraft above the cliffs as we pitched and yawed in the unpredictable jabble below. Most impressive was when several hundred adolescent birds lifted off the helicopter landing area to fill the sky above us with these magnificent birds. It’s always fun for me to ‘visit the estate’ as I do at every opportunity. But it’s twice the fun to be sharing it with people seeing it for the first time and watch them still beaming from the experience as we unload they all safe back on dry land. This entry was posted in Education, Environment. Bookmark the permalink.